Ocean Golf & Country Club is one of the most prestigious complexes in the area of Golf del Sur and this has to be one of the nicest apartments. It also benefits from optional air conditioning too! Set on the 2nd floor (the complex only has 3 floors) but the block is nicely raised up, so the living room and the balcony offer absolutely wonderful views across the ocean and golf course. You can actually sit on the sofa watching TV and also be admiring the lovely views at the same time. The Apartment has one bedroom with twin beds, fully tiled bathroom, a beautiful fully fitted kitchen including washing machine, and a spacious lounge with sofa / sofa bed, armchair , dining table and chairs, Satellite TV with FULL English TV (BBC, ITV, CH4 and SKY) and patio doors leading onto the balcony. The apartment has an air conditioning unit that can only be switched on or off by a remote control. There is a £30 supplement if you require the remote control and therefore access to air conditioning. There are bars, restaurants and supermarkets just a couple of minutes walk away. The new marina is also close by as is the main shopping centre at San Blas (10 min walk) where you will find plenty of evening entertainment. There is also an abundance of bars, restaurants, supermarkets and souvenir shops etc in the centre. Table and Chairs, Clothes Dryer, Views of the Atlantic Ocean and Golf Course. 10 minutes from Airport, 15 minutes 20 minutes to Playa de Las Americas (by car). Tea, coffee, sugar, milk and water provided on your arrival. Towels and linen change weekly. This apartment is looked after by a local management company called Tenerife Holiday Homes THH). Their contact details will be sent to you when you book. Many people book these apartments, reassured in the knowledge that THH are close by should you require them. THH also offer a very popular taxi meet and greet service to meet you off the plane and also have a fleet of hire cars that can either be left at the airport or at the apartment. Please enquire further about these services when you have booked. 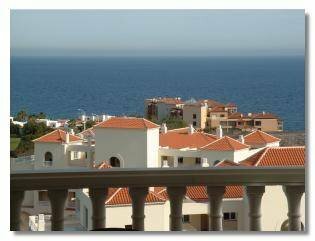 The balcony has beautiful sea and golf course views and looks out over the whole resort of Golf Del Sur. The apartment has optional air conditioning. One of the communal pools is heated!